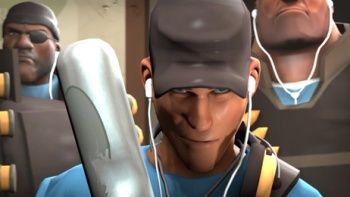 Is Team Fortress 2 Coming to Mac Today? Valve is trying to tell us something about Team Fortress 2, something involving tree fruit. Aside from making games and running Steam, Valve is a master at keeping secrets. For example, take the following post on the Team Fortress 2 official blog: "Big things are happening RIGHT NOW at Valve. Things involving cultivated tree-fruit. BIG things. Things that rhyme with "grapple." Things that rhyme with "Speem Gortress zmavailable on the Babac." Obviously, there may have been a teensy bit of sarcasm there, but the post seems to suggest - if I am decoding it correctly - that Team Fortress 2 will soon be available on the Mac. The post, which went up yesterday, promises big things today, but whether that means that TF2 will actually be available on the Mac today, or we're just going to hear about when it's coming, isn't currently clear.